Be the first to share your favorite memory, photo or story of Reed. This memorial page is dedicated for family, friends and future generations to celebrate the life of their loved one. Reed Dewey Bryan, Sr. 79, widow of Sandra Fogel Bryan, died Thursday morning February 14, 2019, at Tidelands Georgetown Memorial Hospital. Mr. Bryan was born in Andrews on July 21, 1939, a son of the late Lorenzo Benjamin Bryan and Lena Mae Sports Bryan. He grew up in the Andrews area and attended Williamsburg School. He served in the US Marines and was a member of Piney Forest Baptist Church. Mr. Bryan’s passion was working, hunting, and, most of all, raising animals of all kinds including, dogs, cats, cows, goats, squirrels,and any others that would come around the house. Reed loved life and had a great since of humor. He will surely be missed in the community. 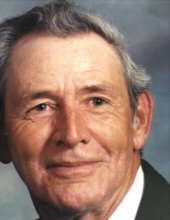 In addition to his wife and parents, Mr. Bryan is predeceased by: four sisters, Lawanda Hanna, Willa Mae Gordon, Leona Tuberville, and Lella Neal; and a brother, Russel Bryan. Surviving are: a son, Reed Dewey Bryan, Jr. (Cindy) of Andrews; a daughter, Genenne Davis of Virginia; four grandchildren, Robert Louis Suggs, III (Kelly) of Charleston, Wesley Bryan of Andrews; Benjie Bryan of Kingstree, and Corey Davis of Charleston; and five great-grandchildren, and a sister, Edaphell Sims of Stafford, VA.
Funeral Services will be three o’clock Saturday afternoon, February16, 2019, at Piney Forest Baptist Church. Officiating will be the Rev. Kevin Brown and Bruce Brown. Burial will follow in Piney Forest Cemetery. The family will receive friends Friday evening, February 15, 2019, at the Andrews Chapel of Mayer Funeral Home from six until eight o’clock. To send flowers or a remembrance gift to the family of Reed Dewey Bryan, please visit our Tribute Store. "Email Address" would like to share the life celebration of Reed Dewey Bryan. Click on the "link" to go to share a favorite memory or leave a condolence message for the family.